Barbizon Lighting will be exhibiting April 8-11 at the annual NAB Convention in Las Vegas showing customers the latest and greatest advancements in broadcast and content acquisition equipment. 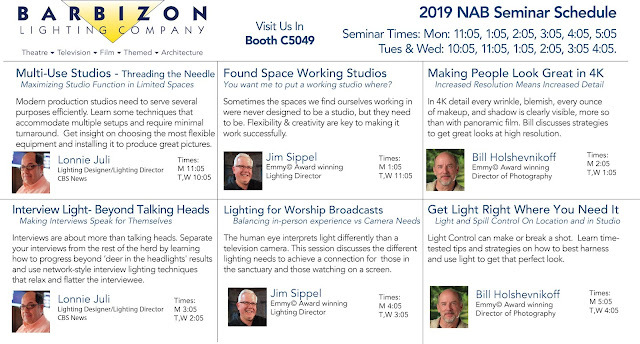 Complete with a new booth design to facilitate in-booth education, Barbizon Lighting will expand their NAB Show expo-floor educational sessions this year in central hall booth #C5049 from April 8-11 in Las Vegas. This year’s presenter lineup includes Bill Holshevnikoff, an Emmy© Award-winning Director of Photography, lighting designer and educator, Holshevnikoff has been lighting and shooting broadcast, corporate and documentary programming for over 30 years. The second presenter is Jim Sippel. A two-time Emmy© Award-winning lighting director, Sippel has over 25 years’ experience in the entertainment industry. A partial list of clients Jim has worked with includes WGN TV Chicago, Big Ten Network, Comcast SportsNet, Disney Broadcast Group, Sinclair Broadcast Group, Scripps Broadcast Group, Hearst Broadcast Group, NBC Sports, FoxSports, Stadium (@ United Center), OXCreates, Signature Production Group, Fusion Productions, Willow Creek Church. The third presenter is Lonnie Juli. After almost four decades working in network television production, Lonnie Juli might be expected to take a “seen it all, done it all” attitude. Instead, he strives to integrate traditional high standards with state-of-the-art technology to provide the highest quality results, while minimizing cost and complexity. Mr. Juli’s resume runs the gamut from small market affiliates to network television productions for CBS, NBC, PBS, FOX, and others. He has designed for News, Sports, Daytime TV, Lifestyle, Talk Shows and several Presidential Debates.